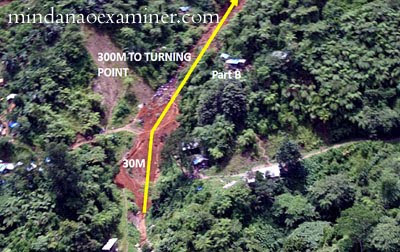 Photos released by the Philippine Army's 10th Infantry Division to the Mindanao Examiner show the area in Compostela Valley's Pantukan town where the landslide occurred Friday, April 22, 2011. DAVAO CITY, Philippines (Mindanao Examiner / Apr. 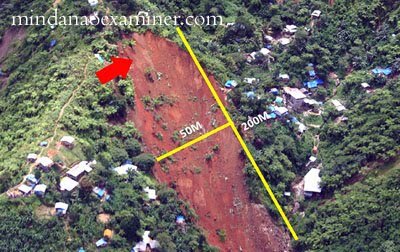 23, 2011) – Two more bodies had been found buried under debris of mud and boulders on a mountain village Saturday afternoon as search for survivors continue for dozens of people still missing from the landslide in the southern Filipino province of Compostela Valley. 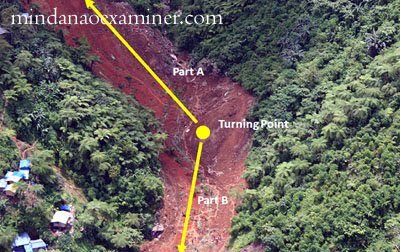 “Two bodies were found trapped in a deep area hard for rescuers to reach. Rescuers are still planning how to pull out the bodies,” Army Major Rosa Maria Cristina Manuel, of the 10th Infantry Division, told the Mindanao Examiner. She said rescuers have recovered three bodies since Friday after a portion of the mountain in Pantukan town collapsed and burying as many as 20 houses. 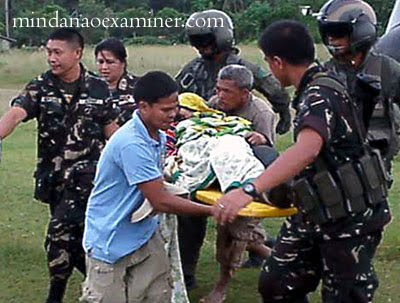 A military spokesman on Friday said as many as 50 people were buried alive from the landslide that occurred at around 2.30 a.m. in the mountain village of Panganason. She said 13 people have been rescued since Friday. Heavy rains have loosened boulders and mud in the village.